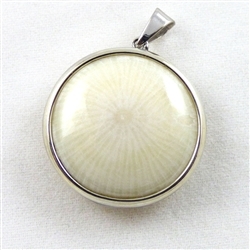 Beautiful Circular White Coral Pendant in Sterling Silver alloy. This pendant is specially designed to allow for a wide surface area of skin contact. The dimensions of the gemstone pendant are .75 inches in diameter - total length is just over 1 inch. Pendant dimensions: approximately .75 inches in diameter just over 1 inch in length. Set in sterling silver.